Nobody's Buying US Treasuries Except "Other Investors" & Mutual Funds? Today's question: Who buys and holds America's federal debt? 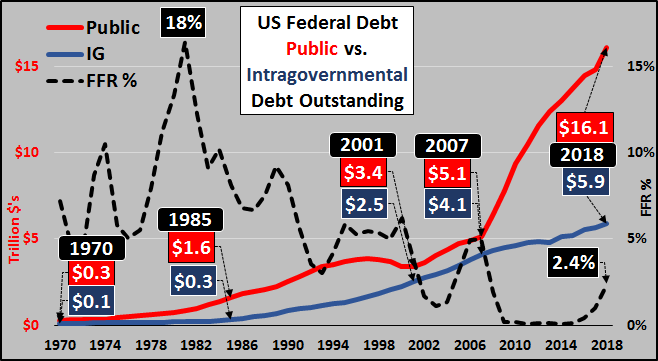 To begin, the chart below shows the growth of US debt (split between public marketable debt and non-marketable Intra-Governmental holdings) and Federal Funds rate since 1970. Public marketable debt is skyrocketing while debt held by Intra-Governmental trust funds continues slowing. 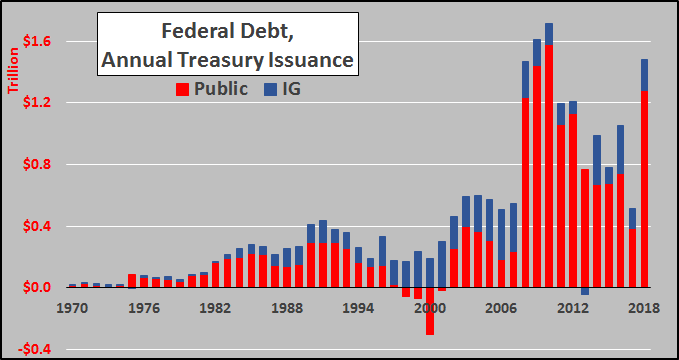 As for the annual change in US debt, the chart below outlines the increasing quantities issued to the public (marketable) debt versus what was purchased via Intra-Governmental trust fund surplus'. Note the diminishing IG versus surging marketable debt. 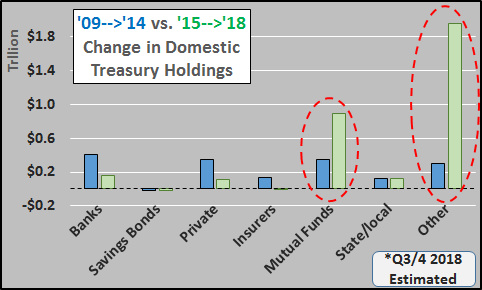 But thanks to the quarterly publication of the Treasury Bulletin, the Treasury roughly details the changing ownership of US Treasury bonds in four buckets; the Federal Reserve, Intra-Governmental surplus trust funds, foreign held, and domestically held. Below, which of those four buyers bought and held all that debt from 2009 through 2014 (blue columns) versus 2015 through 2018 (green columns). The changing buyer types before, during, and post QE are quite radical. +$300 b or (4%) vs. $2 trillion (51%)?!? All this can be seen in the Treasury Bulletin December 2018, page 51...Table OFS-2 Estimated Ownership of US Treasury SecuritiesSource; Office of Debt Management, Office of the Under Secretary of Domestic Finance. Finally, perhaps the biggest question of all is who is buying all the middle and longer dated issuance? As QE was officially completing its taper in September of 2014, the spread between the 2-10yr and 2-30yr was 200 to 275 basis points, respectively. Simply put, the 2yr offered just 22% of the return of the 10yr and a 1yr offering less than 5% of the 10yr. If one wanted yield, one had to buy the longer dated issuance and could use significant leverage to take advantage of the fat spread. 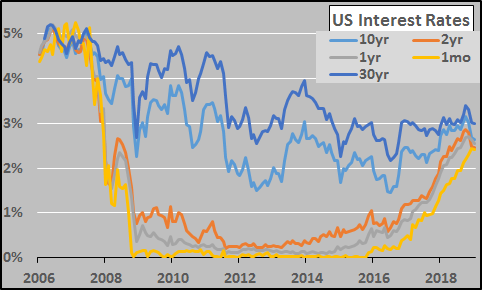 However, by mid 2018, the spread of the 2-10 and 2-30 had plunged to just 30 and 45 basis points...and now on even the 1 year vs. 10 year is just 8 and 44 basis points. Heck, the 1 year is now offering 97% of the 10 year yield at just 10% the duration....and even a 1 month bill gets you within 21 basis points of the 10 year (offering 92% of the yield for less than 1% of the duration?!?). Given this, only a buyer without profit motive would use leverage to borrow short to buy long dated debt with a negative return assured. So, why would individuals or institutions buy 7 year to 10 year Treasury's, particularly when the yields are less than half of the necessary 7% to 8% plan annual returns??? Funny thing is, the 7 to 10 year durations are exactly what the Fed has primarily rolled off its balance sheet! 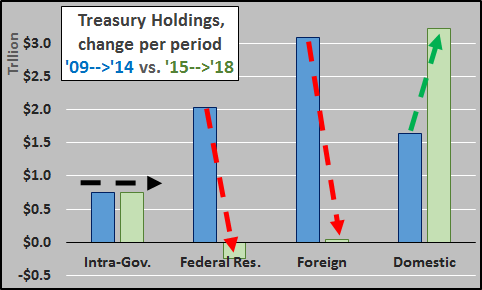 The chart below details the Federal Reserve Treasury holdings from January of 2009 through January of 2019. Note the Fed's 7 to 10 year holdings are highlighted in yellow. 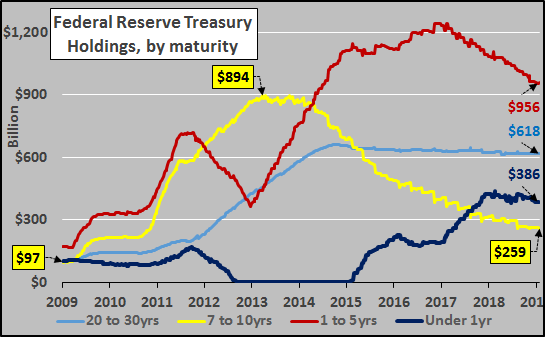 The Fed added almost $800 billion 7 to 10 year debt from 2009 through early 2013, and has subsequently reduced its 7 to 10 year holdings by $635 billion. 7 to 10 year debt now comprises just 12% of Fed held Treasury's, down from 50% in early 2013. So, the Fed isn't buying and has in fact rolled off a massive quantity of mid duration US debt, foreigners aren't buying, banks aren't buying, insurers aren't buying, American's aren't buying savings bonds, state nor local governments are buying, and there is little to no spread to compensate any leveraged "investors" to buy mid to longer duration US debt. Yet the Treasury tells us that "other investors" (suddenly became hyper-interested just as QE ended) and have come up with over $3 trillion in cash since 2015 to buy low yielding US debt like never before?!? Is there any party (aside from central banks or central bank conduits) that could come up with such gargantuan quantities of dollars to yield so little and do it essentially without leverage??? Tell me again, who buys US Treasury's...and particularly who buys mid and longer duration US debt (responsible for setting the 30yr mortgage rate)??? Otherwise, this may sadly be the smoking gun of an active, accelerating, and perhaps unraveling Ponzi scheme?